Russia and Jordan have agreed to a joint expedition to find the ruins of the Biblical Sodom & Gomorrah. Genesis 19 records the destruction of the cities by God. Russia has agreed to fund the cost in order to find the remains. The Russian Government has always been fascinated with the Dead Sea and has coveted it's minerals for years. Russia and the Hashemite kingdom of Jordan are two major players in Bible prophecy for the last days. Ezekiel 38-39 describes a coalition of nations that will come against Israel in the last days. Many prophecy scholars believe that the "Gog-Magog" leader will be that of Russia itself. I happen to be of that same persuasion. C S Lewis, when publishing his study Bible in 1909 said that "Gog-Magog" is Russia. The Jewish Historian Josephus Flavius stated in his writings, "The Antiquities of the Jews" identified the area of Gog and Magog as the area occupied by the Scythians, which today would be located in south central Russia. The Jewish prophet Ezekiel tells us that when Russia and an Arab/Islamic coalition of nations invade Israel, that Russia would come to "take a spoil" (Ezekiel 38:12-13; 39:10). I believe that "spoil" will be the plundering of the Dead Sea and Israel's oil (if confirmed). 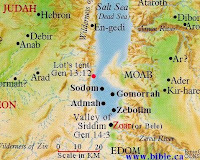 Jordan is mentioned in Daniel 11:41 as "Edom, Moab, and the chief of the children of Ammon". That is Jordan today. Two thirds of Jordan come from Lot (through an incestuous relationship with his daughters in Genesis 19), and one third comes from Esau, the twin brother of Jacob. When the Antichrist destroys the king of the north (Syria) and the king of the south (Egypt) he does not touch Jordan (Dan 11:40-41). The reason is that God will supernaturally shelter the Jews there for the last three and a half years of the tribulation period, (Isa 16:1; 4; 63:1-6; Rev 12:6; 14). Jesus the Jewish Messiah will return at the end of the tribulation to rescue those Jews in Petra (Jordan) and come to Jerusalem, where his feet touch the Mount of Olives (Zech 14:4). Jesus the Messiah will reign for 1000 years in Jerusalem, with the beast and false prophet in the lake of fire, and Satan bound in the bottomless pit. Satan will later be cast into the lake of fire when the millennial Kingdom concludes, (Rev 20:4). Does this news story have a connection to Bible prophecy? Only time will tell. I do believe however that what we see in the political does set the stage for the events in the prophetical. Jesus is indeed coming soon and it could be today. The Rapture of the Church could take place at any moment and we need to be ready.